What do you do when a sentient cosmic event rampages through Japan? ASSEMBLE A-FORCE! Marvel's newest hero, SINGULARITY, has escaped Battleworld and found her way to the Marvel Universe! But she didn't make the journey alone. To combat the villainous ANTIMATTER, Singularity will call upon Earth's mightiest team of Avengers. And one thing's for sure: They are A FORCE to be reckoned with! On Battleworld, there was an island paradise called Arcadia, protected by the women of A-Force. But Battleworld is gone, along with all the women who fought to make it better. Except for one. I was first drawn to this series because I've read some of G. Willow Wilson's work in Ms. Marvel and I liked it a lot. 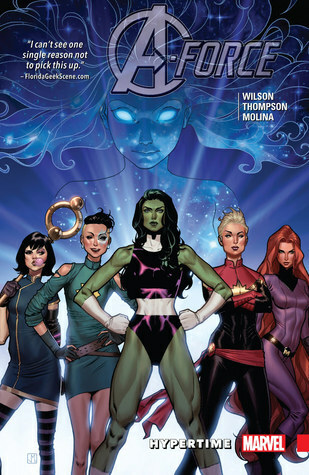 When I found out that this was about an all women team of superheroes, I knew I had to read it. The only one of these characters I knew before this comic was She-Hulk. I'd heard of Captain Marvel - don't think I'd seen or read anything that she'd been in, though. So I was entering this with pretty much no knowledge - and it worked wonderfully. I'll admit, I am more than tired of those superhero groups with four to eight men and one or maybe two women. (*cough*Avengers*cough*) I mean, really? So a major reason I wanted to read this was because of the all woman line-up. Even the science support are women, and that makes the feminist in me giddy. This story also hits one of my all-time favorite dynamics in any story. These women don't get along. They bicker and squabble. They have differences of opinions and disagree. But they have always got each others backs. And I think that's a beautiful thing. "We're here to help. Right in this moment you're surrounded by women like you. Women who have been through things. Maybe not the same things, but a whole lot of traumatic crap." If you buy the same one I did, there is also a couple of bonus comics. One is old, probably from the seventies or so. I didn't read it because the beginning sounded sexist and the end was REALLY sexist and the bind-up would have been better off without it.